The Pure Yoga Namaste 10’3 is the original yoga SUP with maximum (35″) width, providing amazing stability on the water giving you the confidence to practice and master any yoga pose. Hybrid (glass/carbon) paddle for inflatable SUPs 3-piece hybrid (glass fibre shaft and carbon blade) Paddle, recommended for iSUP, adjustable between 178-210cm, suitable for paddlers 5'1'' - 6'5''. 3-piece paddle is suitable for inflatable Stand Up Paddle Boards since it will fit into the same back pack as the board. Durable paddle for inflatable SUPs 3-piece Fiberglass Paddle, recommended for iSUP, adjustable between 178-210cm, suitable for paddlers 5'1'' - 6'5''. 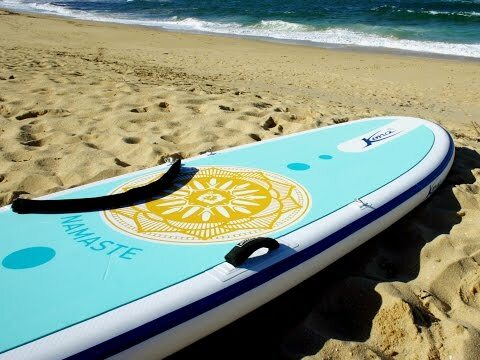 When Namaste was developed the ambition was to take SUP yoga one step further and truly capture the spirit of yoga. We carefully listened to the experiences of our paddle board and yoga community and paired that with our own design expertise. The result was Namaste, specially designed for yoga and fitness activities. Since its introduction it has become a favourite among many yogis and yoginis thanks to its outstanding board stability and unique design. It is equipped with straps for anchoring and attaching the paddle. The brushed deck covers a maximum area of the board to allow good grip and flexibility when moving along the board. There is no compromise to the paddling qualities with Namaste. It is also an excellent board for recreational paddling similar to the Active-series. The All-round Yoga Namaste 11’0 is a development from the successful Namaste 10’3. It is also built specifically for SUP yoga. Thanks to it’s increased length and slimmer (33″) shape, riders will now experience even better glide for longer paddling trips in addition to enjoying all the original benefits Kona’s Namaste range offer for SUP yoga and fitness.